Welcome to this lesson series on water baptism. These lessons are part of a much larger study series called, "A Faith that Obeys." That series may be viewed at www.afaiththatobeys.org. If you are watching this lesson on YouTube or some other channel please go to the website so you will find all the lessons for every subject. Now, let's talk about baptism. There is an argument raging in the religious world which questions whether water baptism is necessary for salvation or the forgiveness of sins. I will be presenting both sides of the argument but I've gotta tell you that I have become convinced that baptism is necessary for salvation. This series of lessons may convince you also. And I will tell you up front, my goal is to persuade you to that conclusion. Now if you think you've heard all this before, I suspect that by the end of this first lesson, you may have a major shift in your thinking. Just hear me out then decide. In order to define and understand the arguments, it may help to know a little bit about the proponents. The first group are those who believe that water baptism is not necessary for salvation. They say baptism has absolutely no connection to the remission of sin. This would be the position of most of the evangelical world today. Their position states that when someone makes a heartfelt and sincere commitment to Jesus Christ, sins are forgiven and we are saved. This salvation experience happens at some point in time before water baptism. Many of these same people are baptized later but not for the forgiveness of sins. In the other camp, are those people who believe that baptism IS necessary for salvation and it has an incontrovertible connection to the forgiveness of sins. They teach that someone who is not baptized is not saved. They believe that baptism is the exact point in time salvation occurs. Many would further clarify a subtle nuance... water baptism does not save you but you are saved by God at the time of your baptism. Since this is a doctrinal position held by people from a variety of religious groups, it becomes a little difficult to give this group a label. They are sometimes referred to as Anabaptists but even that term would not be completely accurate. It may surprise you to know that the Catholic and Lutheran churches both hold that baptism is for the forgiveness of sins. This is heard in the creeds they recite every Sunday morning. Those creeds are based on a version of the Nicene Creed which was adopted in 381 AD. That creed explicitly states,"We acknowledge one baptism for the remission of sins." The problem with baptism in these churches relates to the issue of infant baptism and the method of baptism. We will be studying those issues as well. So, our main issue always comes down to one question. "Do I need to be baptized to be saved?" I think this is a great question because it so aptly captures the nexus of the argument and must have a yes or no answer. Now, this debate is nothing new. It has probably been an around for nearly 2000 years,if you consider that the Nicene creed we just discussed was modified in 381 AD to include the phrase about baptism for the remission of sin! While this debate is probably really old, it's gained a lot of attention in modern Christianity for a variety of reasons. But you know what? I think we might just be able to solve this entire debate in the next 60 seconds! If we do, this entire series will become academic and educational. If we don't, these lessons may serve to convince you otherwise. Let's shine a fresh new light on the subject and use a little logic. Start your timer and consider this. Fact: The Evangelical world doesn't reject water baptism. They just believe a person's sins are forgiven at some point in time before water baptism. Many churches tell new believers that they should be baptized soon because it is a command of Christ. Like me, you're probably unaware of any church that claims baptism is NOT a command. On this point, both proponents agree. Baptism is a command of Christ. Are you with me so far? So! If baptism is a command of Christ, can I be saved if refuse to obey Him? You see, if I am unwilling to obey His commands, He is not my Lord. If I don't have Him as Lord, I can't have him as savior. I am living an unsurrendered life regardless of any sincere, heartfelt professions of faith I may have made in the past. Well, the minute is up! When we humbly consider this perspective it becomes pretty obvious. If we won't have a Lord, we can't have a savior. I think it is time for both sides to toss out this really tired argument. The argument should never have been about baptism. The argument is really about obedience. The modern evangelical world has embraced salvation by grace through faith and completely ignored the very prominent and scriptural calls for obedience as part of the salvation experience. 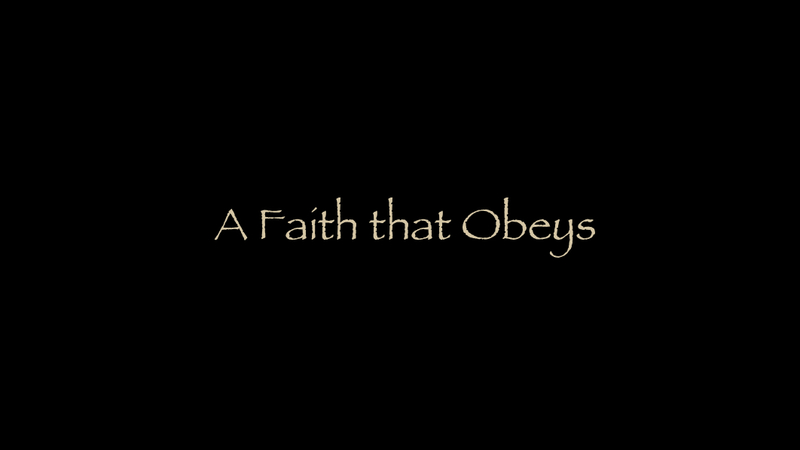 Watch the lesson on "Obedience" at "A Faith that Obeys." In that lesson, you will discover that the forgiveness of sins never occurs anywhere in the Bible before obedience. Baptism is necessary for salvation because it is a command which must be obeyed. Now if you are not completely convinced at this point, it may be because you have that special presupposition widely held in the evangelical world which leads to a major logical fallacy. Let's define a term before we move on. A presupposition is facts or information which will be used at the beginning of an argument. So, from a solid presuppositional platform, you construct your case, argument or conclusion. In the argument that baptism is NOT necessary for salvation, the presupposition I'm talking about states that, "Baptism is a human work." Once again, this brings up another point on which both proponents agree, "We can not be saved by works." So, the group which believes that baptism has nothing to do with the remission of sin starts their reasoning from a very specific position... and their argument goes like this: Baptism is a work. We are not saved by works. Therefore, baptism has nothing to do with salvation. In our discussions so far we have already found two points on which we both agree. One, baptism a command of Christ and two, we can not be saved by works. So, let's put all of this together. God gives us a command and we choose to do it. How does our obedience to God's command become a work of human effort? It can only become a work if we deny that it has anything to do with a command of God. We've heard this before and it is just as effective today as it was then? "Did God really say baptism is a command?" Baptism can not be work of man because it is a command of God. Man has no choice but to obey it if he truly loves Christ. The logical fallacy occurred because the original presupposition... "baptism is a work" is not true. This erroneous presupposition is the standard bearer for the modern evangelical world's position on baptism. They can not see the Biblical Plan of Salvation because they are starting from the wrong starting point. If baptism was a work, their argument would be valid. When we are willing to see things from a fresh perspective, the old argument just doesn't hold water. Sorry. Isn't it strange that something so obvious is so hidden? How did we ever arrive at the conclusion baptism is a work of man? I think both of the answers we just presented are the most compelling reasons to accept water baptism as part of the Biblical Plan of Salvation but there are more. In the next lesson, we will begin reviewing both sides of the debate. In order to keep the lessons as short and organized as possible, I'll break each lesson down by topic or objection. This will also make it easier to find answers in the future. First, we'll discuss the common objections to water baptism as part of the salvation experience. Next, we'll look at infant baptism and then, the method of baptism as outlined in the scriptures. Finally. We'll thoroughly cover what actually happens in water baptism. If you are already convinced that baptism is necessary for salvation, you will appreciate the answers to all the objections which are so common in this debate. That's the academic part. If you remain unconvinced at this point, I humbly submit these thoughts for your consideration. I have been where you are now and it is because of my respect and love for the scriptures that I was able to change my opinion. Now, let's give a bit more attention to the first common argument which we have already touched on... Baptism is not necessary for salvation because it is a work of man.